The Casio EX-Z450 is a likeable enough compact camera, offering a good package of compact dimensions, versatile wide-angle lens, large LCD screen and HD movies, but ultimately it fails to excite. The 4x, 24-112mm lens is versatile enough, covering everything from wide-angle landscapes to head and shoulder portraits. 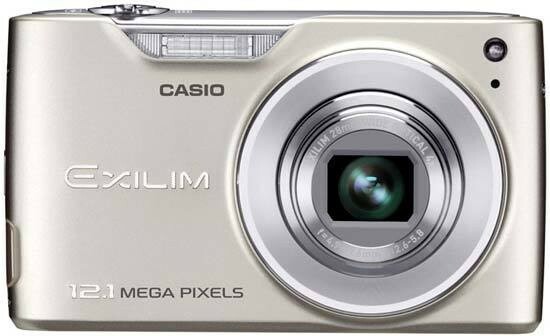 We have reviewed other comparably sized compacts with bigger ranges though, such as Panasonic's DMC-ZX1 with its 8x zoom. The LCD screen is appealingly large, but suffers from a rather average resolution of 230,000 dots, while the HD movie mode is hamstrung by a 10 minute time limit, large file sizes, average sound quality and most importantly the inability to use the optical zoom lens during filming. Image quality is only satisfactory, with noise and loss of detail at relatively slow ISO speeds, limited maximum shutter speed of 4 seconds, and a disappointing macro mode. This isn't the camera to buy if you're looking for the best ever image quality, but the EX-Z450 does produce well-exposed and accurate photos that will please the majority of its target audience. Which leaves us with a well-built, fairly compact and stylish little camera that doesn't offer enough features or image quality to stand out from the crowd. The Casio EX-Z450 is only really worth a look if you can find it at a discounted price.